Drum corps fans: You can see the best of the best in marching music giving everything they have in the quest for the World Championship title this year, even if you can't make it to Indianapolis. 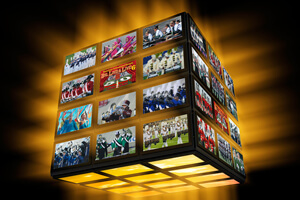 Big, Loud and Live 6, the live high-definition broadcast of the Drum Corps International World Championship Quarterfinals, will be shown in more than 400 theaters around the country on Thursday, Aug. 6. This one-night-only event will feature the complete performances of the top 15 World Class corps and highlights from the seven additional that will have performed earlier that day. This year's edition of the live Drum Corps International cinema event will be more like the real thing than ever before, as the broadcast will be recorded and produced entirely in high definition, ensuring that theater audiences experience the indescribable sound, color, movement and energy of drum corps excitement in a manner second only to being there live at Lucas Oil Stadium in Indianapolis for the event. Veteran producer and director Tom Blair brings more than 35 years of drum corps experience to the production, having marched as a member of the Glassmen and the Cavaliers in the 1970s and working on Drum Corps International television programs since the '80s. He explained that while previous Big, Loud and Live broadcasts have been transmitted in HD, the events were shot and processed with standard definition equipment. This year, everything will be shot and presented in all of its high definition glory. "We'll be using HD cameras and processing everything through a broadcast truck equipped to handle the HD feed. With that comes a very clear picture, and it'll be phenomenal on the big screen," Blair said. "I'm very excited about it. Between the tremendous audio that is associated with the surround sound and the color, movement and imagery of the drum corps, it's absolutely the perfect application for high-definition programming." Watch the Big, Loud & Live 6 movie trailer. The show will be hosted by longtime DCI broadcasters Steve Rondinaro and Dennis DeLucia, along with John Madden who is the director of the Michigan State University Marching Band and a former drum corps member. They will also be joined by former Phantom Regiment drum major Will Pitts. Fans at the theater will be able to experience the show very much like fans at the stadium would, with the addition of commentary, analysis and exclusive interviews from the hosts between performances. "With the HD capabilities and the tremendous quality of the production—my goal with the Quarterfinals broadcast is to take the theater audience to the event. We won't spend a whole lot of time doing features and stories and that sort of thing. We're taking you to the World Championships right from your theater seat, if that's the only way you can get there." Two years ago, Big, Loud and Live was digitally streamed to just over 100 theaters, giving almost 23,000 fans the opportunity to see the event, and 2008 brought more than 34,000 fans to movie theaters from coast to coast. This year's competition will be broadcast to nearly 400 select movie theaters in 45 states, giving drum corps enthusiasts the opportunity to see their favorite corps almost anywhere. "We would love for everyone to be able to come to the World Championships in Indianapolis, but we know that is not always possible," said John DeNovi, director of business development for Drum Corps International. "This is truly the next best thing to being there, and with so many theaters around the country, it's easier than ever to be a part of the action." Enhanced Big, Loud and Live broadcasts aren't the only benefit that will come from DCI's switch to high definition. "The single greatest benefit is certainly quality of the image, but the very fact that we can get the event recorded in HD finally puts us in a much better position for the future," Blair said, explaining that the HD recordings allow the possibility of producing Blu-ray discs or utilizing other emerging technology in the future. Blair said even a standard definition DVD will have a better, clearer picture when produced with native HD footage. "The theater audience will benefit, the standard definition DVD product will benefit, the Fan Network will benefit, and the future needs of DCI will be better served by having this material recorded in HD," he said. Big, Loud and Live 6 will be broadcast from the Drum Corps International World Championship Quarterfinals at Lucas Oil Stadium in Indianapolis on Thursday, Aug. 6 beginning at 6:30 p.m. Eastern time. Tickets are now available through FathomEvents.com. View a complete list of participating theater locations and more.